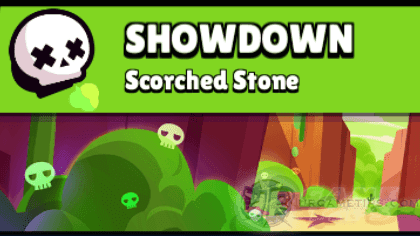 Here's some quick tips and guide on how to survive and win Brawl Star's Showdown event mode (Scorched Stone Map), in the fast-paced multiplayer online battle arena mobile game app for Android and iOS players. - Scattered across the map but spawns randomly. If you are unlucky, you won't get any boxes near your spawn point and need to move towards the center or other areas just to get them. Some locations will spawn 1 or more than usual. - Depending on spawn points, and how enemies will move, you might need to fight for Power Cubes. - The center area will definitely get lots of boxes (random numbers), so expect an early match, unless there are lots of campers. - Map is fairly open, obstacles and those bushes are so thin making it easier to scout, so in general, I would recommend ranged Brawlers here. Melee type brawlers are also good if they can manage to survive. - There are lots of maps that are better for campers than this one, surviving here is based on luck (if most major fights will take place somewhere else other than your location). - It is easy to get spotted here because those bushes are so thin, making it easier for ranged scouts. They can also just walk near those walls to spot campers. - The worst part is, if there are lots of campers (long battle and you'll still lose) and teamers, this could be a very bad map to play on, so avoid for now if that happens. Not recommended for low level Brawlers (ex: Below Power Lvl 5 playing at around 380 Trophies). - If you want to play this map, here's some tips on how to survive early on, to avoid getting 10th or 9th place at least. - Grab Power Cubes that you can, but don't get greedy, moving a lot is risky especially when you are using squishy or low Lvl Brawlers. - Use all bushes nearest to you to hide asap especially when spawned not near the corners. Check enemy movements, if you see them going to the center or away from their spawn point, quickly go to where he/she came from, most of the time it's empty and safe (preferably near corners). - Wait until there are around 6 survivors left (need luck) then go aggressive, at this point you need to. Recommended for ranged brawlers, for melee stay hidden for as long as possible. - Note: The center area is a risky location especially when there are 4 or 5 survivors left. - Getting 1st or 2nd here is kinda hard as well depending on the situation and Brawler you are using, including upgrades and power cubes, unless you are lucky to get last hits. 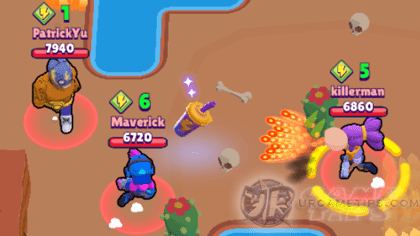 - Examples: Shelly, Nita, Frank, Pam, Poco, and similar Brawlers. - To give you a higher chance of surviving, here's some example Brawlers that you might want to use. - Most of the time, the end game would be a 4 or 5 way stand-offs, so having a range and decent HP is an advantage (Upgrades and Power Cubes). Plus, they would usually go and kill off low HP Brawlers first. - Examples: Bull, El Primo, and similar Brawlers. - For these guys, the best camping location would be at the center, it's very risky but if you can control this area with high decent Power Cubes early on, getting top 5 should come smoothly. - Try to ambush or trap squishy and slow moving brawlers that you can using those obstacles and poison clouds (best done once there are only 6 or less survivors). 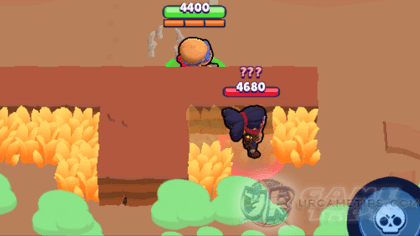 - Watch out for possible counters like Shelly and Leon though, that can also go inside those bushes and try to control the area. - Also, be careful not to get hit a lot while you are inside those bushes, quickly eliminate squishy Brawlers that you can once those poison clouds closes in, forcing everyone to move closer to the center. - TIP: When using Darryl's Super for escaping, you can target those waters near the center to roll farther! - Examples: Barley, Dynamike, Leon, Spike, Crow, Gene, and similar Brawlers. - Their range alone is deadly for this map because they can easily scout bushes, harass, and easily fend off enemies. These example ranged brawlers are extremely annoying to deal with depending on how well you play them. - You can also use any ranged Brawlers like Colt, Brock or Piper depending on your play style, but be careful though because these are squishy and easy to die from ambushes. 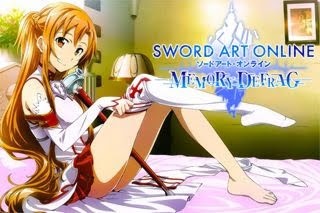 Those obstacles are also hindrance because they can easily escape and regenerate their HP. - Once those poison clouds closes in to the center, use those obstacles and cactus plants as shield. Do not let anyone come near you, kill them off asap. - If you are at the corner, use your attacks to force those that are inside those bushes to fight other Brawlers and to stay away from your location. If available, use your Super to clear out bushes near you to create space.